1. Iris Chase Griffen (Laura's older sister) narrating her daily life as an old woman: the weather, her struggles to walk around town, trips to the donut shop, her bitterness toward people, her regrets, etc. 2. Iris telling the story of her and Laura's upbringing. They come from a privileged family (their father owned a button company), but their childhood is tainted by their mother's death and their father's disinterest. A period of excitement comes when they meet a radical, Alex Thomas, but he quickly leaves the picture. Later, Iris gets married to the businessman/politician Richard Griffen, but their marriage is not a happy one. 3. Newspaper clippings from local Canadian papers (in and near Toronto) about the sisters and their relatives: marriage announcements, obituaries, society pages, general news stories, etc. 4. The story-within-a-story, The Blind Assassin. 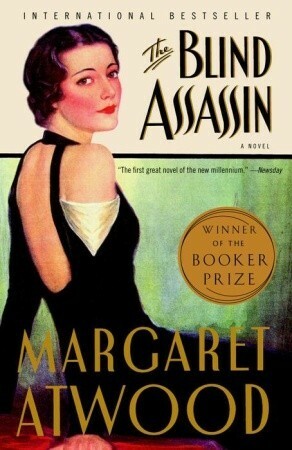 Laura becomes a famous novelist after her death when her book The Blind Assassin is published. The main part of the story revolves around two lovers, a wealthy woman and a man constantly on the run, who are having a secret affair. The man writes cheap sci-fi books which brings us to the last section . . .
5. The story-within-a-story-within-a-story (whew! ): a sci-fi story told orally by the man to his lover in the novel The Blind Assassin. The story involves the title character, a blind assassin on a far-off planet of strange people who sacrifice young girls after chopping out their tongues. It sounds more complicated than it is. Atwood manages all of the sections well so that you're never confused or left hanging. I really admire her talent for writing- both her technique/style and the way she is able to cleanly pull together such an intricate plot outline. However, I did find myself bored. A lot. I read "The Handmaid's Tale" a few years ago and really enjoyed it, so I guess I was expecting something similar. But "The Blind Assassin" is much slower moving. I'll admit that as I was nearing the end, I skimmed a little. It got tiring to listen to old Iris talk about the weather and the plants and the old town. The book has a really slow start, and it does pick up a little, but if you're looking for quick plot movement or a character study or something, you're not going to find it here. We move at a snail's pace in almost all of the sections. And nothing particularly interesting is happening either, though that could be attributed to the narrator Iris's lack of emotion or self-reflection in key moments. I wouldn't say the ending saves it, but it helped greatly. It's one of those endings that make you rethink everything you've just read. I reread the first few pages after finishing it, and they felt so much more meaningful then. But a good ending and smart plotting cannot erase my great boredom throughout this book. I had to really push myself through it. VERDICT: 2.5/5 stars. I liked it, but it was a struggle.